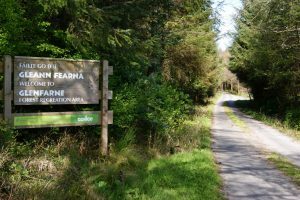 There is a choice of 3 varied length walks in the local Glenfarne Demesne, or for the more experienced, there is the Glenfarne Plateau, Leitrim Way or the Cavan Way. Location: Glenfarne Demesne is about 1/2 km north of Glenfarne on Manorhamilton/Enniskillen road. It can be located on discovery map number 17, grid reference H-015 405. Facilities: There is a picnic area and boat quay at the lake. Harvesting of trees takes place on a regular basis in this area, so the visiting public should exercise care when visiting this site. You can also view four sculptors which have been erected along the shores of Lough Macnean. Length of Trail: At Glenfarne Demesne you can enjoy about 2.5 km of walks or a drive along the lake shore. Habitat: The site is on the shores of Lough Macnean. Main Tree Species: The Demesne forest comprises Sitka spruce with some Norway spruce, old Scots pine and European larch. Some oak, ash, holly, birch and alder are also present. Other Flora: Common woodland flora with iris and reed on the shoreline. Fauna: Red squirrel, badgers, foxes and hares can be found at Glenfarne Demesne. You can also see some Mallard duck which congregate on the western shore of the lake during winter and spring. History: The site consists of old woodland (part of the Tottenham Estate) most of which is re-planted.